The first residence that Gilbert designed for himself and his wife Julia was a Shingle Style design, dominated by a tall overhanging gambrel roof. 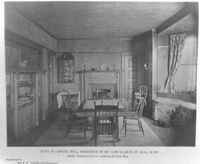 Gilbert's original house has been greatly altered. A tuck-under garage has been added, the shingles have been removed and replaced with stucco and half-timbering, and some windows have been replaced, although it retains many of its original leaded-glass windows. 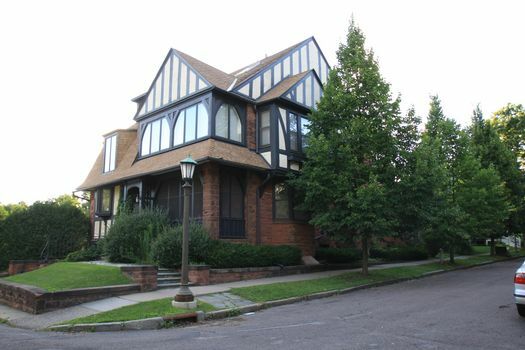 The brownstone-faced first story is unusual in Saint Paul and unusual for Gilbert but a common design element in East Coast Shingle-Style buildings and some of Gilbert's summer cottages. 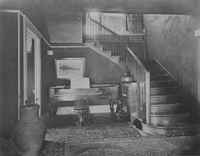 The interiors included a sitting room-stair hall of the type that had been popularized by McKim, Mead & White and a dining room with colonial details. When Gilbert built his modest house on its small lot, the street was named Floral. It was later changed to Heather Place to honor the family that originally owned most of the property in the neighborhood and from whom Gilbert bought his lot. He wrote his mother that the asking price for the lot was $5700, but he was going to offer $5000. [CG to Elizabeth Gilbert, December 1,1889, LOC-CGP] The house cost $6500. In 1890, the view from Gilbert's house was spectacular. To the southwest, he could see the houses on the bluff of Crocus Hill, including the two houses he designed for the Adams family. To the southeast, he could see across the Mississippi River valley. 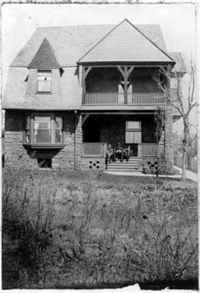 Gilbert had moved to New York before Reed & Stem blocked his view with the California-inspired, English Cottage-style houses at 5 and 7 Heather Place, built for the Goodkinds, Gilbert's client for the Mannheimer Memorial (1904-1905).